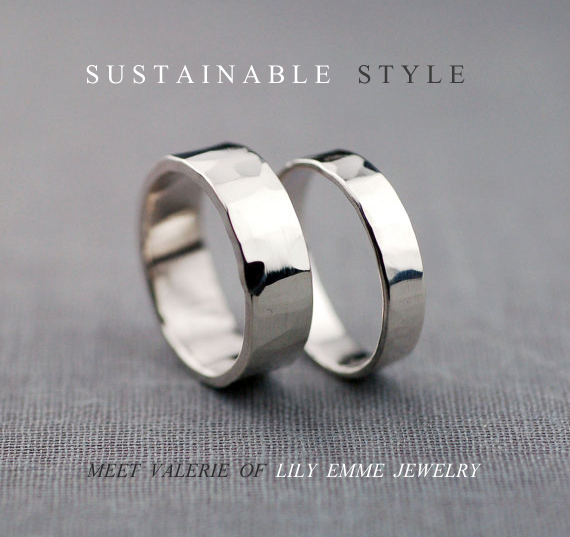 Today's post is a special interview with this month's featured sponsor, Valerie Nethery of Lily Emme Jewelry. Valerie hand makes incredibly beautiful jewelry using recycled materials and ethically sourced gemstones. Her designs are elegant, modern and timeless, and I'm very excited to be able to share this peek into her life and work with all of you! Hi Valerie! Tell us a little bit about yourself and where you live. Hi everyone! 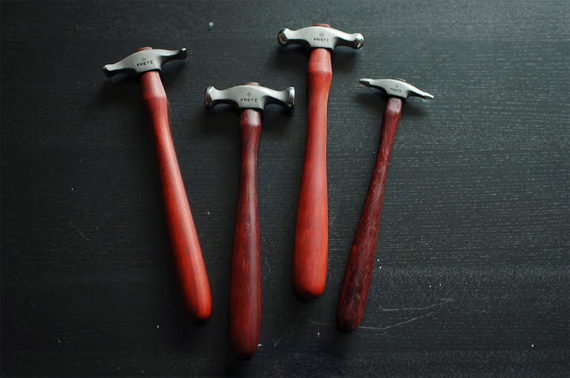 My name is Valerie and I’m a metalsmith from Seattle. I love my city, and I live downtown where there is always a constant rumble of things going on. It's a pretty city (when it's not raining), and I enjoy our contemporary architecture just as much as I enjoy a good hike (like this one) in our mountains. 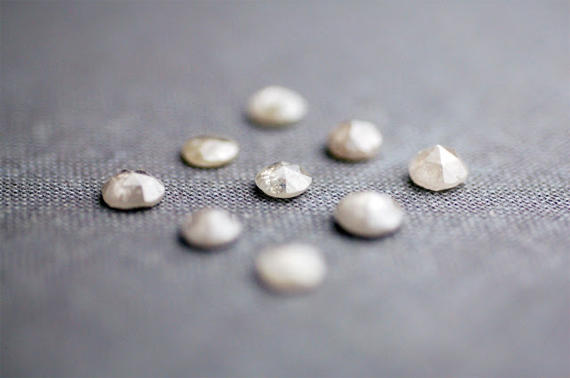 How did you become interested in making jewelry, specifically sustainable jewelry? I definitely didn't grow up thinking I was going to be making jewelry, but rather, thought that I would be working as a wildlife biologist. But I happened upon a bead store when I was in college (studying for said degree) and shopped there so often that the staff told me I should apply to work part-time there. 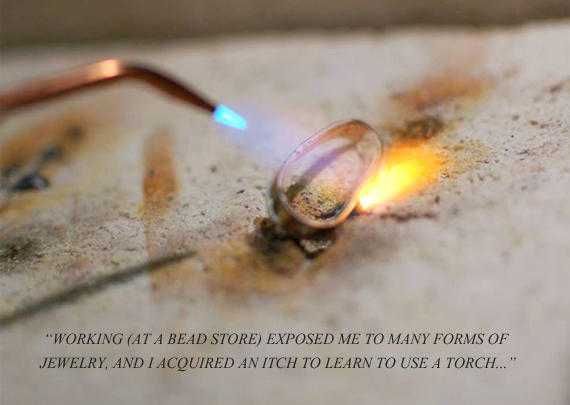 Working there exposed me to many forms of jewelry, and I acquired an itch to learn how to use a torch. It's been a slow but delightful journey as I've learned this craft. I've been metalsmithing for 3 years now while working my day job in an office environment and I couldn't be happier with where I am. I have a degree in Environmental Science and while finding a career in that field didn’t work out for me, I still identify with many things that I learned. It’s important for me to try and leave as small a footprint as I can. Jewelry can be a very, very dirty industry unfortunately, and many people are unaware of the degradation, human and environmental, that takes place for the sake of personal adornment. We may be unknowingly funding these issues if we are not considerate of where are purchases come from, but I believe we have the small power to make changes here and there that are better for this earth, and still let us have the things that we enjoy. 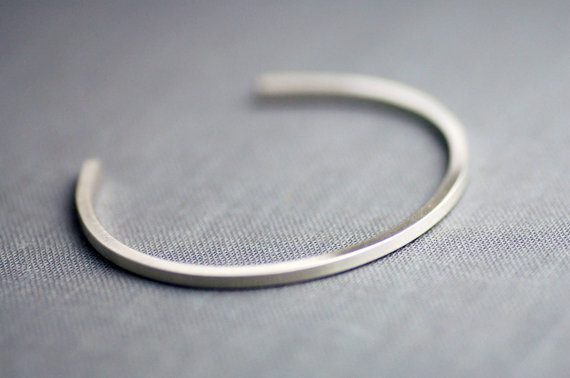 My jewelry uses metal from a company that supplies certified 100% recycled metals and I in turn refine all of my metal scraps back into the recycling system. Recycling metal is better for the earth and ensures ethical jobs for the industry. New designs will be added to my shop this holiday season featuring diamonds and those, too, are will be ethical and conflict-free. How I love gold. 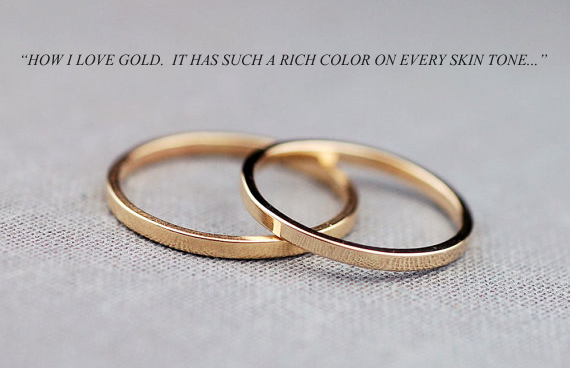 It has such a rich color on every skin tone and I love to apply a brushed finish to give it a contemporary look. 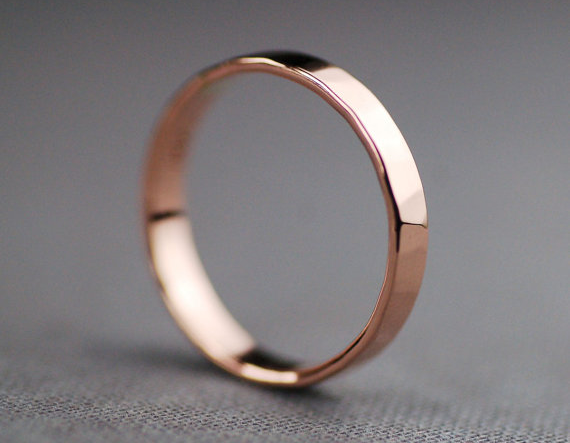 14K rose gold is also lovely and it’s a very nice shade of pinkish gold. What types of things inspire you in your work? Are there any other artists or businesses that have influenced you creatively? I enjoy clean, simple modern lines and shapes. I create jewelry that I hope can outlast the trending jewelry of today but still be worn on a daily basis if you feel like it. I want you to be able to wear my pieces on any occasion and still receive compliments on them in the many years to come. One artist who really inspires me is Sarah Loertscher. She is actually the talented metalsmith who taught me my first metalsmithing techniques. 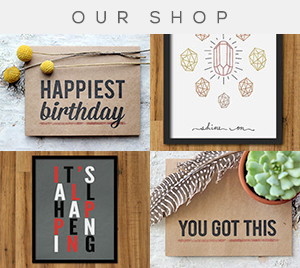 She creates wonderful geometric designs and I am always inspired and motivated by her work. 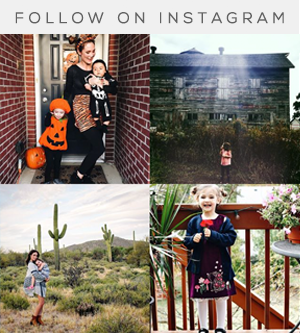 The Bubby and Bean blog focuses on living a creative lifestyle. Aside from making your jewelry, are there other things you particularly enjoy creating? I really enjoy watercolor painting. I picked up my first paintbrush about a year ago and fell in love. I also thoroughly enjoy baking and cooking. I'm a vegetarian/pescatarian and I'm fortunate to be living in a city with a variety of sustainably caught fish species. Oh, that's a difficult one! I'd say currently, it's the 14K gold initial pendants. 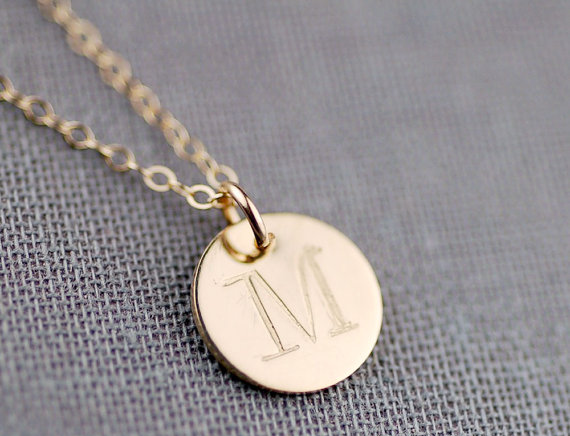 The letter you choose is so special, be it your initial or that of a much loved one. Each one is so personal and my hope is that a smile will appear each time you look at it. In 5 years... Well, I try not to plan these things because it's fun to be spontaneous, but if I can still be making jewelry that's a definite plus. I would like to get more into complex stone setting to 'ooh and ah' you guys so we'll see. Like everyone else, I'd love to do some traveling and hope to go to a few countries within the coming 5 years. It's easy to become complacent and I want travel and see so much! My favorite color is the color of the clear beach water on a white sand tropical island (as you can see here!). My favorite movie is Monster's, Inc, followed by most movies starring the handsome Daniel Craig like The Girl with the Dragon Tattoo. I know - very opposite! My favorite food is Mexican because I'm half Mexican and the food is a really important part of my life. I currently love listening to Lana Del Ray - her music is so great! 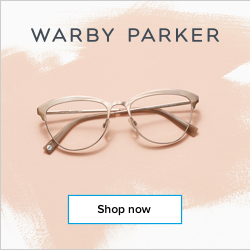 I use Spotify to listen to music while working in my studio and it has helped me discover so many artists. I am so happy to be here on the Bubby and Bean blog! Thank you for having me and taking a look at my jewelry. 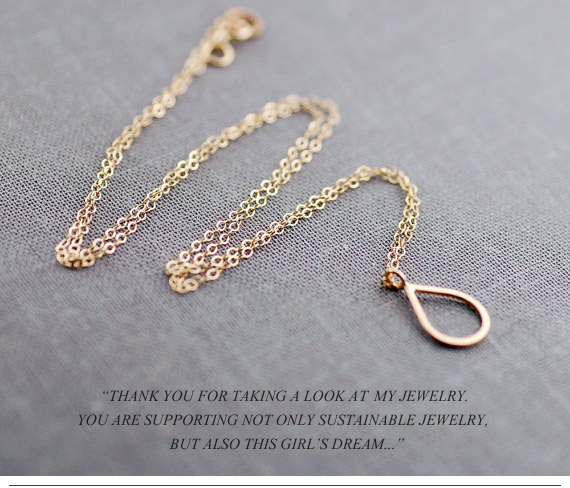 You are supporting not only sustainable jewelry designs but also this girl's dreams. I appreciate your support! 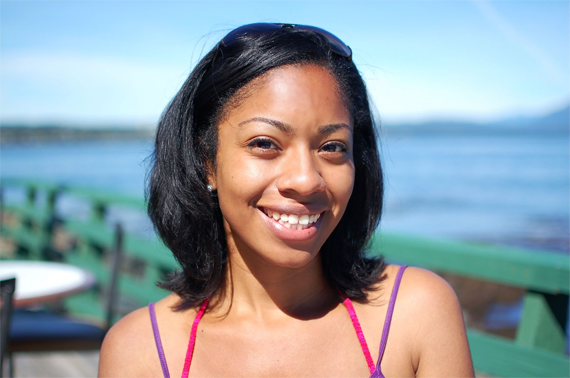 Thank you Valerie for sharing a little about yourself and your work with us! Make sure you guys pay Valerie's shop a visit so you see all of her gorgeous jewelry pieces for yourself. 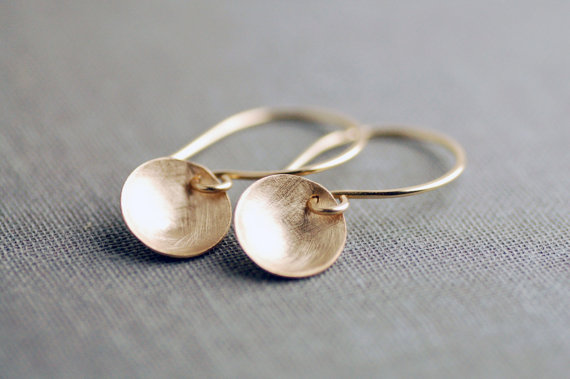 And stayed tuned for a very special Lily Emme Jewelry giveaway next week! Valerie has also generously created a special coupon just for Bubby and Bean Readers: Take 15% off your entire order at Lily Emme Jewelry with code BUBBYANDBEAN2013 through 10/31/13. 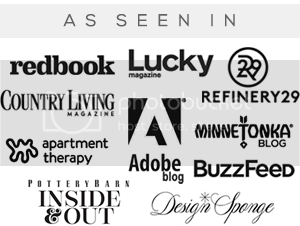 You can also find Valerie on her blog, Facebook, Twitter, Pinterest, and Instagram. I'm a gigantic fan of rose gold, too. Her work is beautiful! Valerie's work is beautiful. It is fantastic that she is making her pieces from recycled metal. Her work is just beautiful! 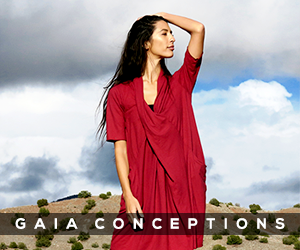 I love that each piece is ethically made. Love those silver rings in the first photo! I'm excited that I will be wearing one of her designs soon! Thank you SO much for your order Randi!!! Great feature! I love the clean lines of her jewelry. Simple and elegant. Love it!